Touch him and you're dust! Tucker Williams: I see Stinger's got you everywhere, telephone man. I'm gonna see you don't ring no more bells. Kickin asses, gettin' wimmenz, savin' chilrenz. Disco Godfather is, quite possibly, the worst film ever made. I think that Rudy Ray Moore could have feasibly wiped his tail with the celluloid and the end result would have been a more worthy feature. Then again, Disco Godfather is probably one of the most entertaining movies I've ever seen. 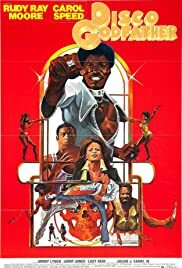 Aside from the three-hour-long roller-skate-disco-dance sequences and the rants about the evils of PCP, the film (and I say "film") is a karate-fightin', rappin-rhymin', booty-shakin', disco-quakin' good time! When Rudy Ray delivers lines like "But how? AND WHY?" with a knowing glance toward his captivated audience, you know you are putty in the hands of a master craftsman. The film's supa-fly climax, a spontaneous kung-fu fest at a PCP warehouse, is one of cinema's finest moments. Just sit back, let the fists fly, and let the carefree spirit of Rudy Ray Moore's 1970's America take you away.